How are youu? Yup, referring to this post title..It is obvious that I wanna talk about hair.. Ahahaha.. Just kidding, I mean toes.. Naaaah, lips! Recently i love to wear red lipstick.. 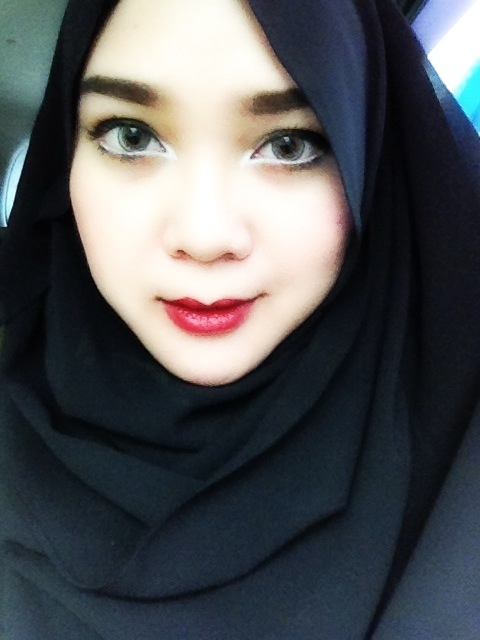 I used to unconfident to wear lipstick with cetar color.. But after seeing my good friend Mrs. Siti Juwariyah with her red lips, it was awakening me that I might be look as pretty as her with red lipstick.. And with her recommendation of good lipstick, so I decided to buy one..
And you know what I felt after buying it and try it on? I loooveee it! Yes! Red lipstick give you freshness and make my facial skin more radiant (somehow).. By using red lipstick, you also no need much make up though.. Let your lips shiiiinee.. Ahahaha..
Well sorry, maybe this post is agak kurang penting.. But I hope it gives you a bit tips or maybe just FYI..
Can you make a tutorial for your make up? You really look beautiful.